CNC "Drag Cut" front wheels to fit YFZ450, Blaster, Banshee and Raptor ATV's. 10" x .125" Blue Label Douglas Wheels fit 4/156 bolt pattern. 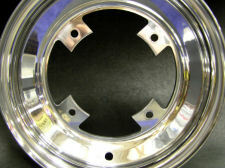 Our 5 inch wide wheel has a 2" offset and a 3" backset. Style #1 has four "square tabs" remaining in the wheel face.